Our customizable body pillows come in three sizes and contain one of four fills. 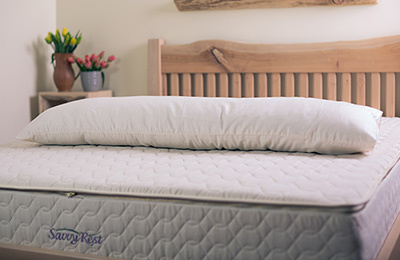 Choose from organic kapok, organic wool, natural latex, or a wool-latex blend. Are you a side sleeper? Do you spend most of the night tossing and turning, searching for a comfortable sleep position? Do you end up collapsing onto your stomach or rolling onto your back and snoring? Are you waking up with a sore back, hip, shoulder or neck? Most of us tend to sleep on our sides, but have difficulty getting that added support for our upper arm or leg or retaining a beneficial sleep alignment with just a head pillow. Savvy Rest Organic Body Pillows are the perfect solution. A body pillow is a long, narrow pillow that runs the length of your body, supporting both your upper arm and leg as well as your torso, offering lasting comfort, support and pressure relief throughout the night. It helps alleviate soreness and discomfort from poor sleep positions. Savvy Rest body pillows have no unpleasant smells or odours due to chemical off gassing. Every pillow is made with breathable organic cotton casings and filled with natural materials like wool, kapok and shredded natural latex. And because they are free of synthetic chemicals, they won’t cause you to overheat. Our most supportive fill in an organic cotton casing. The most unique feature of our body pillows, is that they are customizable. 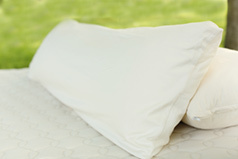 That means you can manage your pillow’s fill as you see fit. Add some in or take some out, it’s all up to you. For instance you can make the lower half of the pillow thinner if you like to sleep with a pillow between your knees, while the upper half remains plump for optimal upper body support. As the pillow naturally flattens with use, you can regularly plump it back up by reaching into the pillow to fluff up the fibers, and you can add your extra fill back in at any time. This lengthens the lifespan of your pillow significantly. If you have back, hip, neck or shoulder issues, a body pillow can help you find pressure relief by offering extra support. It helps your body maintain a comfortable and proper sleep alignment. It can also help improve blood circulation and allow for a healing restful sleep. Body pillows are also incredibly versatile for pregnant women who need help finding comfortable sleep positions during each trimester. The pillow can also continue to be used by mom after baby is born or even as a nursing pillow. Men can benefit from body pillows too, especially if they have broad shoulders, as they often end up with painful twisting when their shoulders and hips collapse. Body pillows also help with snoring by helping you sleep comfortably on your side throughout the night rather than falling onto your back. Body pillows can also help you fall asleep faster by easily helping you find that perfect sleep position. And snuggling a body pillow can feel comforting, allowing your heart rate to lower in preparation for a deep and nourishing sleep. 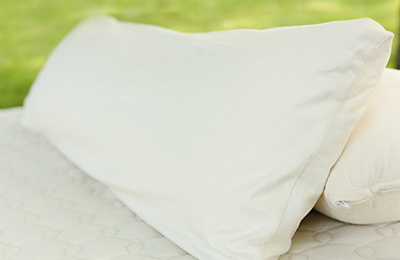 Which Body Pillow Fill Is Right for You? Different fills can help you meet different needs. Here are our tips for choosing the fill that's best for you.